2.How to set up like Demo? 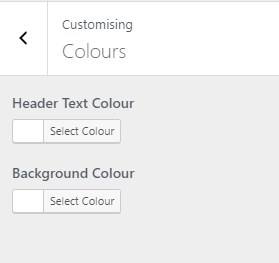 4.How to manage Colours Options? 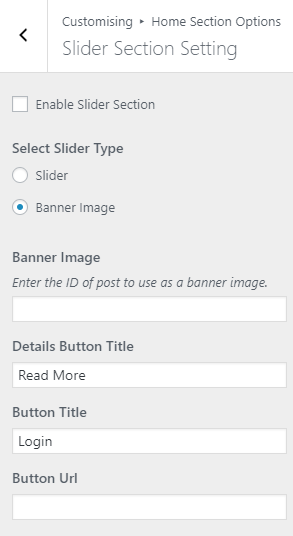 5.How to manage Header Image Options? 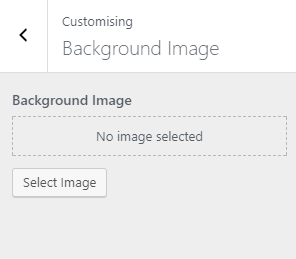 6.How to manage Background Images? 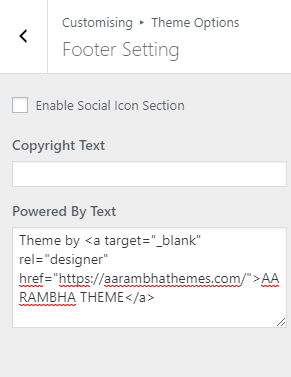 7.How to manage Theme Options? 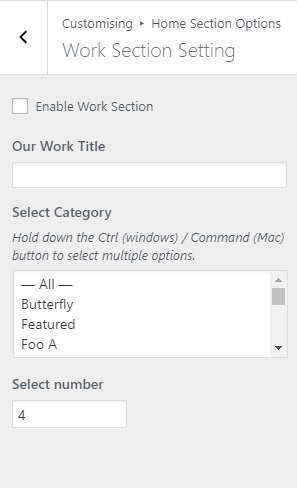 7.1.How to manage Header Setting Options? 7.2.How to manage Footer Options? 7.3.How to manage General Options? 7.4.How to manage Breadcrumb Setting? 8.How to manage Home Section Options? 8.1.How to manage Home Page Sections? 8.2.How to manage Slider Section Setting? 8.3.How to manage Intro Section Setting ? 8.4.How to manage Service Section Setting ? 8.5.How to manage Latest Event Section Setting ? 8.6.How to manage Work Section Setting ? 8.7.How to manage Blog Section Setting ? 9.How to manage Contact Page Options ? 10.How to manage About Page Options ? 11.How to manage Typography Options? 11.1.How to manage General Color Options? 11.2.How to manage Heading Color Setting? 11.3.How to manage Home Page Color Setting Options? 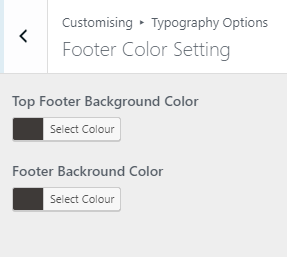 11.4.How to manage Footer Color Setting Options? 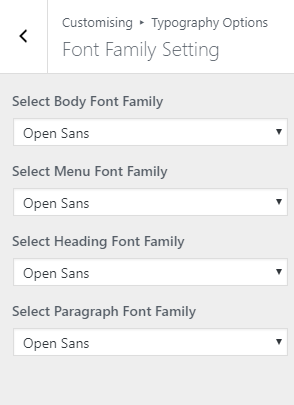 11.5.How to manage Font Family Options? 12.1.How to create a Menu? 12.2.How to change Menu Locations? 13.1.How to manage theme available widgets? 14.How to manage Static Front Page? 15.How to Reset Theme Settings? 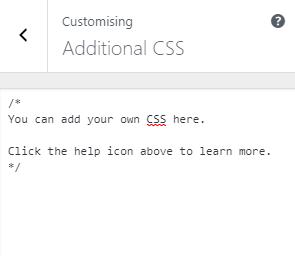 16.How to manage Additional CSS? Click Browse Locate core-corporate-pro.zip Theme in your computer. Select core-corporate-pro.zip and click Install Now. Unzip core-corporate-pro.zip to your Desktop. Using an FTP client to access your host web server, go to /wp-content/themes/ and upload your new copy of Core Corporate Pro Theme. 1. 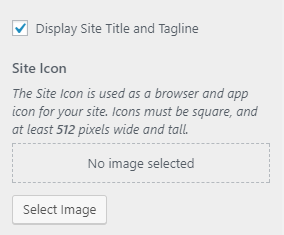 From Customize section, go to Header Image Options.. 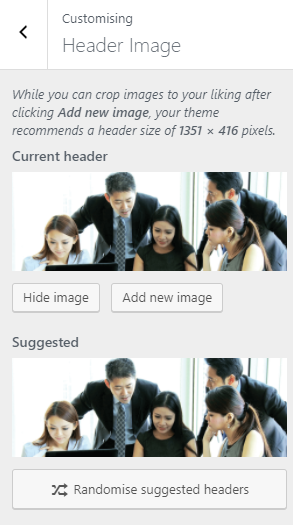 Suggested: You can even use the suggested header image if you do not want to upload other image. 2. 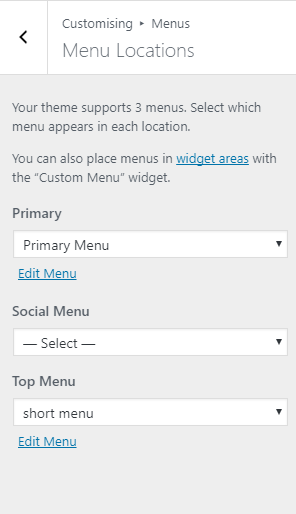 From Theme Options, you will see Header Setting Options. 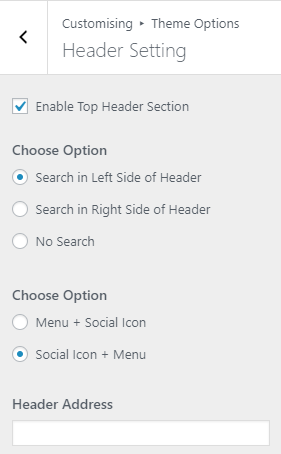 Enable Top Header Section: This option disable/enable the top header section. Choose Option: This options allow you to choose the placement of the search in header . It has three available option to choose from . 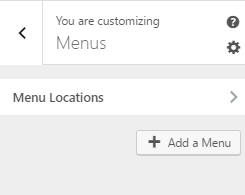 Choose Option: This option allow you to select the order to display the menu and social icon in the header . Here are two options available . Header Address: This options enable you to enter the header address to display in header. Phone Number: This options enable you to enter the phone number to display in header. Contact Email: This options enable you to enter the contact email to display in header. 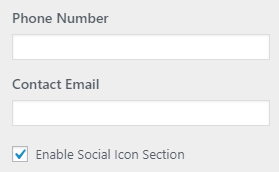 Enable Social Icon Section: This options allow you to enable/disable social icon section in header. 2. From Theme Options, you will see Footer Setting Options. 2. From Theme Options, you will see General Options. Layout Options: This option allow you you to choose the layout for pages from three different layout. 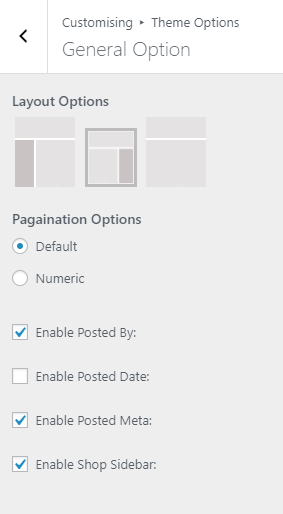 Pagination Options: This option allow you to chose the pagination type i.e Default or Numeric. Enable Posted By: This options disable/enable the posted by option. Enable Posted Date: This options disable/enable the posted date. Enable Posted Meta: This options disable/enable the Posted Meta. Enable Shop Sidebar: This options disable/enable the Shop Sidebar. 2. 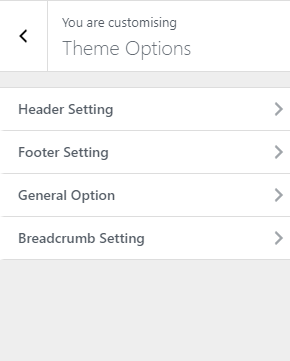 From Theme Options, you will see Breadcrumb Setting Options. 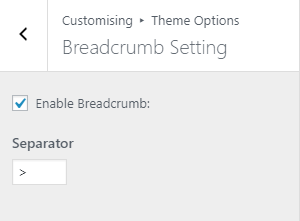 Enable Breadcrumb Options: This option enable/disable the breadcrumb feature. Separator: This option allow you to enter the type of separator . 2. You will sections under Home Section Options as shown below in figure. The above Sections are described given below. 1. From Customize section, go to Home Section Options-> Home Page Sections. Enable Home Page Content: This option allow you to enable/disable home page content. 1. From Customize section, go to Home Section Options-> Slider Section Setting. 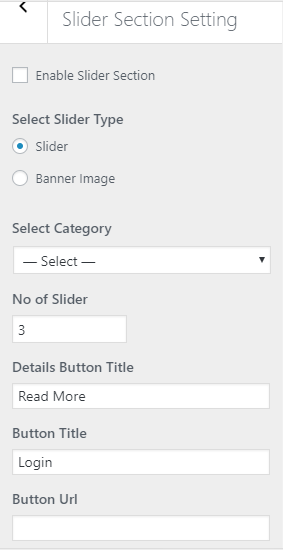 Enable Slider Section: This option allow you to enable/disable slider section. Select Category: This option allow you to select the category to display in the slider. No of Slider: This option allow you to enter the no of slides to display . Details Button Title: This option allow you enter Details Button Title . Button Title: This option allow you to enter Button Title . Button URL: This option allow you to enter Button URL. Banner Image: Enter the ID of post to use as a banner image. 1. From Customize section, go to Home Section Options-> Intro Section Setting. Intro Title: This option allow you to enter the intro title. Add Image: This option allow you add the image in intro section. 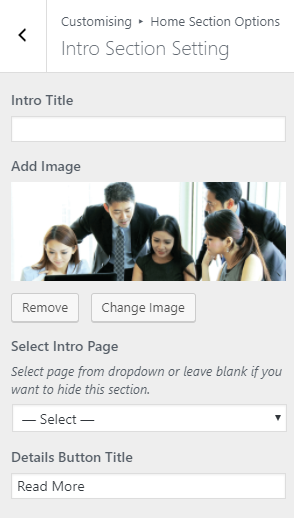 Select Intro Page: This option allow you to select the page to display in intro section. Details Button Title: This option allow you to enter Details Button Title. 1. 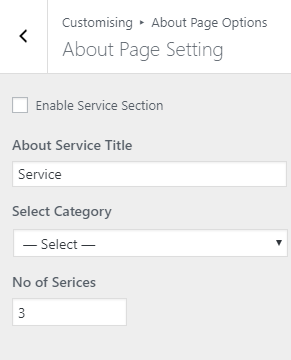 From Customize section, go to Home Section Options-> Service Section Setting.. Enable Service Section: This option allow you to enable/disable service section. Service Title: This option allow you to enter the service title. Add Image: This option allow you add the image in service section. 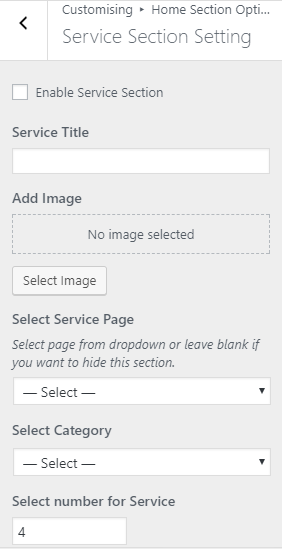 Select service Page: This option allow you to select the page to display in service section. Select category: This option allow you to select the category to display in service section. Select number for Service: This option allow you to enter no to manage the no of services. 1. From Customize section, go to Home Section Options-> Latest Event Section Setting.. Enable Latest Event Section: This option allow you to enable/disable Latest Event section. Latest Event Title: This option allow you to enter the Latest Event title. Latest Event Description: This option allow you to enter the Latest Event description. 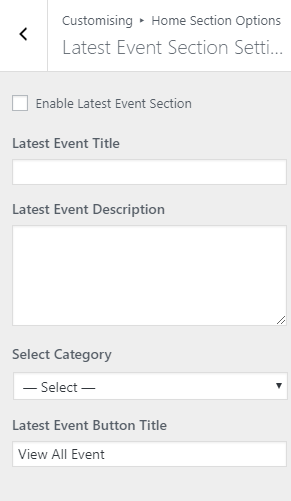 Select category: This option allow you to select the category to display in latest event section. Latest Event Button Title: This option allow you to enter Latest Event Button Title. 1. From Customize section, go to Home Section Options-> Work Section Setting.. Enable Work Section: This option allow you to enable/disable work section. Our Work Title: This option allow you to enter the our work title. Select category: This option allow you to select the category to display in Our Work section. Select number: This option allow you to select the no for the post to display in this section. 1. 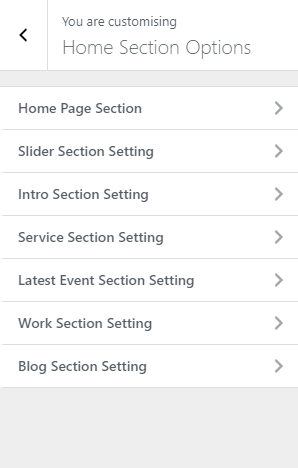 From Customize section, go to Home Section Options->Blog Section Setting.. Enable Blog Section: This option allow you to enable/disable blog section. 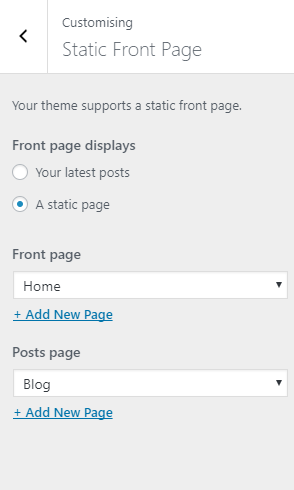 Blog Title: This option allow you to enter the blog title. Blog Description: This option allow you to enter the Latest Event description. 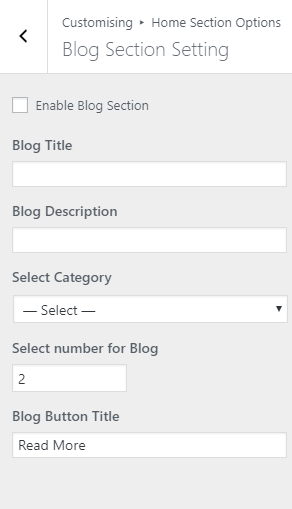 Select number for Blog: This option allow you to select the no for the post to display in this section. Blog Button Title: This option allow you to change the blog button title. 1. From Customize section, go to Contact Page Options-> Contact page setting.. Contact Form Title:This option allow you to change the contact form title. Contact Form: You need to enter the contact form short code . Icon: This option allow you to enter font awesome class to display the icon . Title: This option allow you to enter the title. Contact Number: This option allow you to enter the contact Number. Contact Email: This option allow you to enter the contact email. >Contact Address: This option allow you to enter contact address . Note: You need to assign the Contact page template to make this section work. 1. 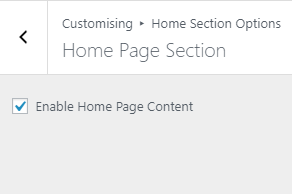 From Customize section, go to About Page Options-> About page setting.. Enable about Section:This option allow you to enable/disable about section. About Service Title: This option allow you to enter about service title . Select Category: This option allow you to select the category of your choice to display in this section. No of Services : This option allow you to enter the no to manage the number of services to display . Note: You need to assign the About page template to make this section work. Heading Color: Select the color available in the options. 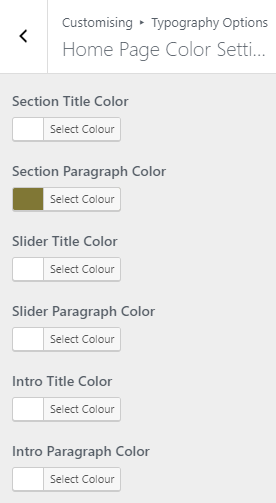 If the preview is fine, click on Save and Publish to apply recently selected Heading color. Hover Color: Select the color available in the options. 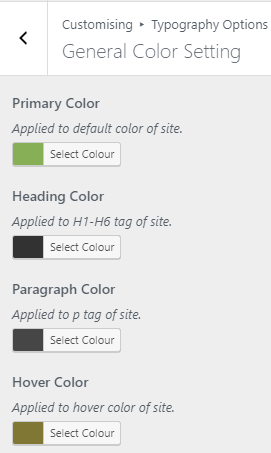 If the preview is fine, click on Save and Publish to apply recently selected Hover Color. Post Meta Color: Select the color available in the options. 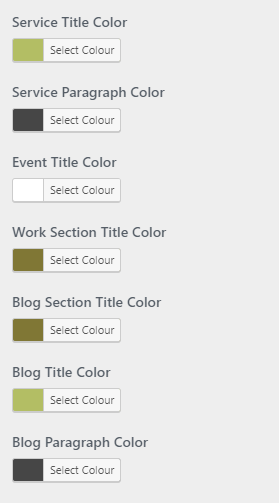 If the preview is fine, click on Save and Publish to apply recently selected Post Meta Color. Active Color: Select the color available in the options. If the preview is fine, click on Save and Publish to apply recently selected Active Color. 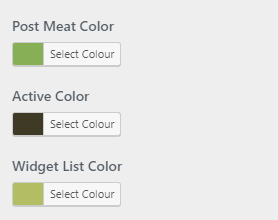 Widget List: Select the color available in the options. If the preview is fine, click on Save and Publish to apply recently selected Widget List Color. 2. From Typography Options, you will see Heading Color setting sections. Heading Color Setting Options: In this section you will see different color options. Now change the color as per your need. 2. 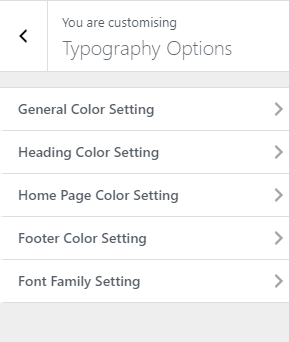 From Typography Options, you will see Home Page Color Setting Options sections. Home Page Color Setting In this section you will see different color options. Now change the color as per your need. 2. From Typography Options, you will see Footer Color Setting Options sections. Footer Color Setting : In this section you will see different color options. Now change the color as per your need. 2. From Typography Options, you will see Font Family Setting Options. 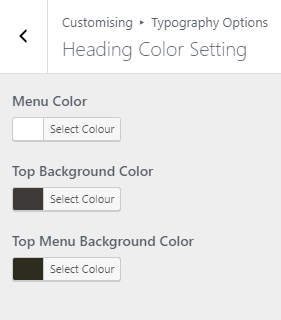 Select Menu Font Family: You can change the Menu Font form here. Select Heading Font Family: You can change the Heading Font form here. Select Paragraph Font Family: You can change the Paragraph font from here. Select the menu for Top Menu. Top Header menu appears on the top header section section. 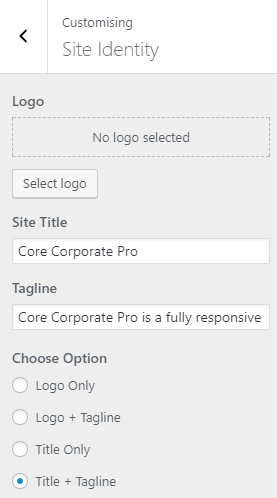 Core Corporate:Recent Posts : You will find options and settings in this widget. Now setup the widget according to your need. See the below image. 1.From Customize section, go to Reset Theme Settings. 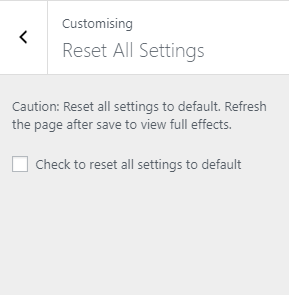 Check to reset all settings: This option reset all the theme settings and resets all the color settings to the default values along with custom header and background will be reset to default.Note: Refresh the page after save to view full effects. Using an FTP client to access your host web server, go to /wp-content/themes/ and upload your new copy of Core Corporate Pro Theme which shall replace the old files.